It's been a busy week of app updates. We've already covered many of them, but there are always more good examples of apps that show off feature of iOS 12 like Siri shortcuts or watchOS 5's new functionality. So, we've collected some additional favorite updates from this past week from Federico, John, and Ryan. John: iOS 12 introduced a new Portrait Effects Matte (PEM) that camera apps can use to capture detailed depth data. The results from PEM are significantly better than camera apps could previously produce, especially for hair and glasses. The main limitation of the PEM is that it works for human subjects only. With the new technology, Halide applies a custom background blur that is different than the one Apple’s Camera app uses. Halide, which we’ve covered before on MacStories, has also added support for shortcuts. Halide’s Advanced Settings include a ‘Set Up Siri Shortcuts’ button that opens a view explaining how Siri shortcuts work and links to Halide’s settings in Apple’s Settings app. There, under Siri & Search are a list of saved and suggested Siri shortcuts. What you can add in Siri & Search depends on what parts of Halide you’ve used recently. One of my favorite shortcuts is the most simple: you can fire the shutter to take a photo hands-free. It’s like a voice-controlled remote control, which is perfect for taking a shot without worrying that you’re making your photo blurry by tapping the shutter button in the app and moving your iPhone in the process. 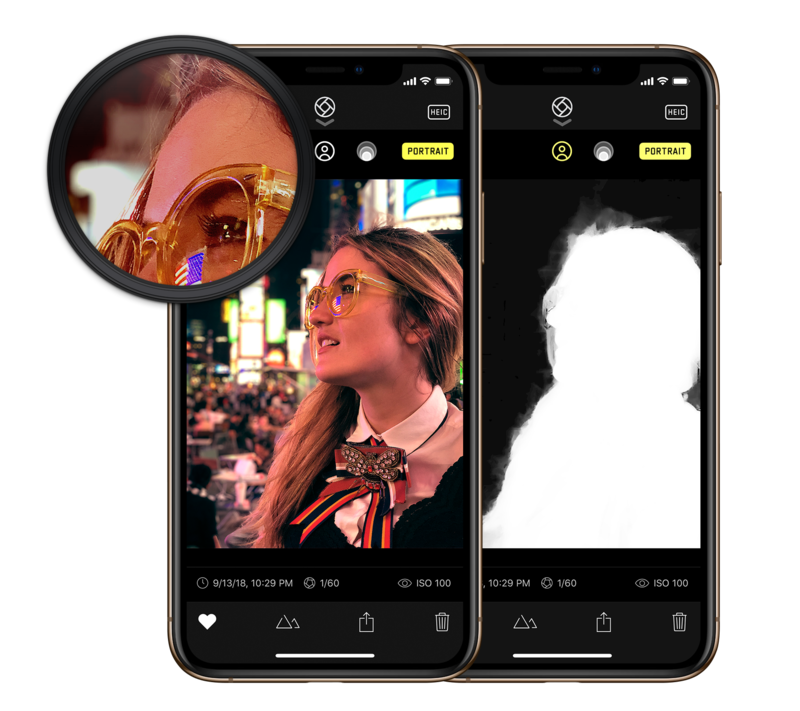 In addition to the new features, Halide’s developers say the app’s performance has been significantly improved. The numbers posted by the Halide team show that the app uses less CPU power than Apple’s Camera app. Halide is available on the App Store for $5.99. John: ETA is a travel time and directions app from Eastwood that we’ve covered before on MacStories. ETA has added a host of Siri shortcuts that allow users to add new locations, check travel times, and start turn-by-turn directions. The shortcuts can be enabled with a custom recorded command from ETA’s entry in the Settings App. My favorite shortcut is the ability to capture locations quickly. When you’re on the go, especially in an unfamiliar place, stopping to figure out where you are isn’t always possible. With ETA’s Siri shortcut, you can add new locations and use the shortcut to return where you were, with the app providing directions and an arrival time estimate. The same tasks can also be accomplished from the Siri watch face for frequently visited locations, although whether the ETA card appears is up to iOS and watchOS and cannot be forced to display by users. ETA is available on the App Store for $2.99. John: WaterMinder is a hydration tracker that we’ve covered on MacStories before. 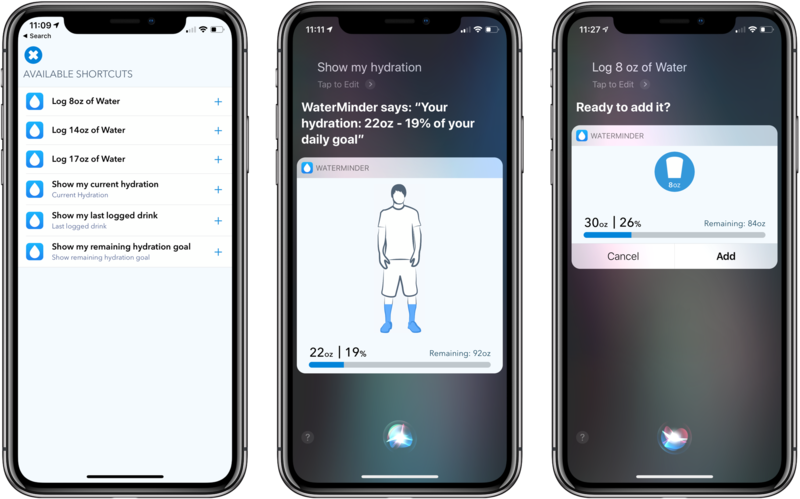 The latest update adds several Siri shortcuts that let users log their hydration, show their hydration status, report their last drink consumed, and show how much more they need to drink to meet their goal. What I like best about WaterMinder’s implementation of Siri shortcuts is the rich interface that’s presented when you use one of the commands. WaterMinder presents an illustrated card similar to the main app’s design that depicts the information being requested or conveyed. For example, logging 8 oz of water consumed shows a card with the current status of your hydration. Siri asks if you’d like to add the water and you can verbally confirm or cancel the request, which Siri acknowledges. Tracking apps like WaterMinder are going to benefit considerably from Siri shortcuts. As I said in my Streaks review, the hard part about tracking apps is removing the friction of tracking. It’s too easy for someone to quit tracking. 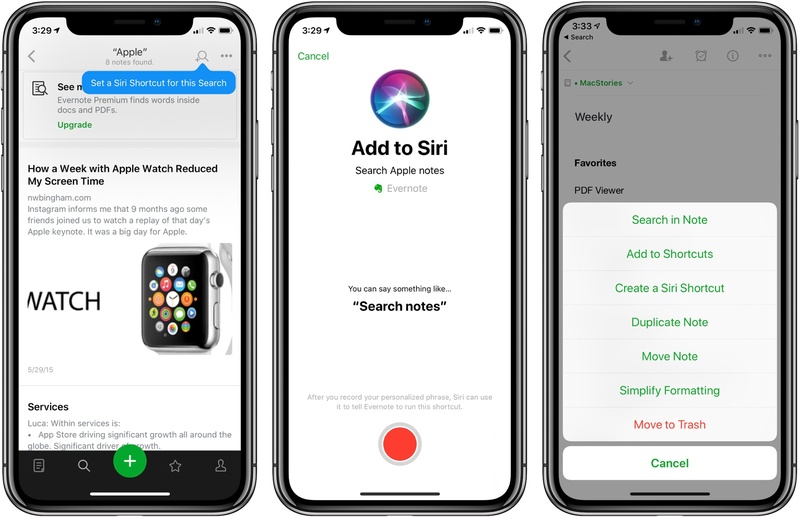 With Siri shortcuts, WaterMinder and similar trackers are more likely to retain users and get them to use their apps more consistently. John: David Smith’s Pedometer++ is another app we've covered in the past and was one of the earliest Apple Watch apps. The debut version of the app pushed watchOS further and worked more reliably than almost any other Watch app I used. watchOS has evolved since then, and so has Pedometer++ with an all-new Watch app that takes advantage of the new capabilities of watchOS 5. The main screen of the app includes the same data as before: step count, mileage, floors, and a graph of steps over time. If you swipe right to left, you can start one of six workouts: outdoor walk, run, hike, indoor walk, run, or ‘Indoor Other.’ The hiking activity is new to watchOS 5 and provides better tracking of elevation than picking a walk would. Taking a page from Workouts++, another of Smith's apps, the real-time statistics displayed during your workout are highly customizable. You can pick from among duration, distance, step count, numerical or graphical representations of your heart rate, and elevation climbed, average speed or pace, and calories burned. 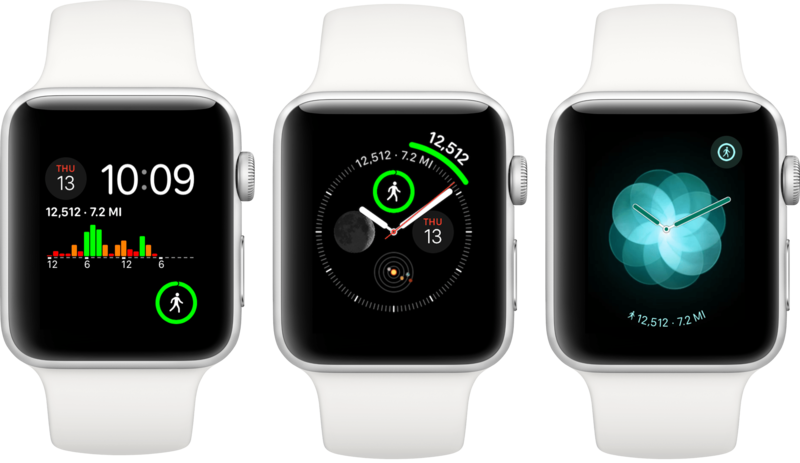 Customization settings are available by swiping left to right on the watch face during a workout and tapping the gear icon. Also, swiping right to left during a workout reveals playback controls for audio playing on your iPhone or Apple Watch, and if you’ve turned on GPS when you start a workout, a tiny map of your route. 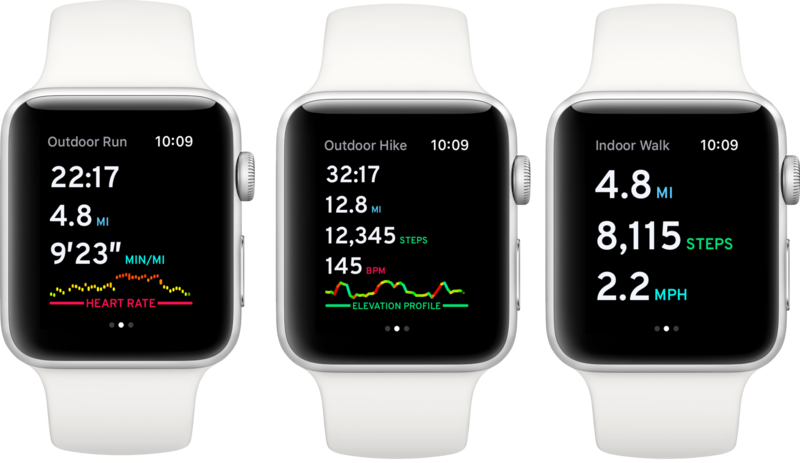 When the Apple Watch Series 4 is delivered to users, they can choose new Pedometer++ complications designed for the Infograph and Infograph Modular watch faces too. Pedometer++ is available as a free download on the App Store, but you can leave a $1.99 tip from the iOS app's settings view, which is something I do periodically to support updates like this one. Federico: As I promised on AppStories earlier this week, I plan to publish a full review of this app in the near future; in the meantime however, I want to highlight Scriptable, created by indie developer Simon Støvring, as one of the most interesting new releases this week, as well as the most powerful addition to my automation arsenal since Workflow. 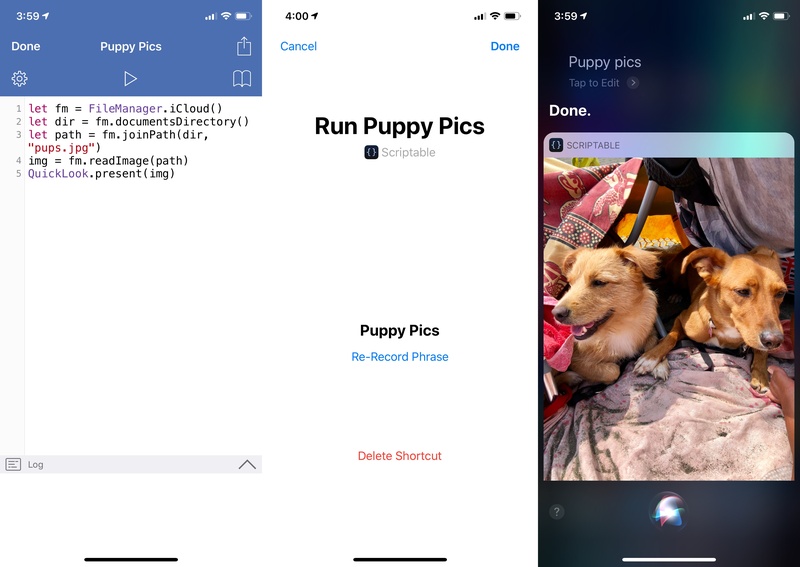 The idea of letting users create their own scripts to automate native iOS functionalities is an extremely powerful concept that allows for basic "programming" without the overhead of writing an app from scratch in Xcode. I argued the same years ago for Pythonista, and the same holds true for Scriptable today – with all the advantages that making an automation app in 2018 entails. Saving screenshots to Files using Scriptable, which can apply tags to each file. Who wouldn't want to have dog pictures readily available via Siri? Ryan: It may not be particularly popular among many MacStories readers, but I've been using the first-party Twitter app on iOS for nearly two years now, and it continues to receive interesting new updates at a regular clip, including quick adoption of major iOS features. Last year the app received iPad drag and drop support quickly, and this year the same proved true of shortcuts. 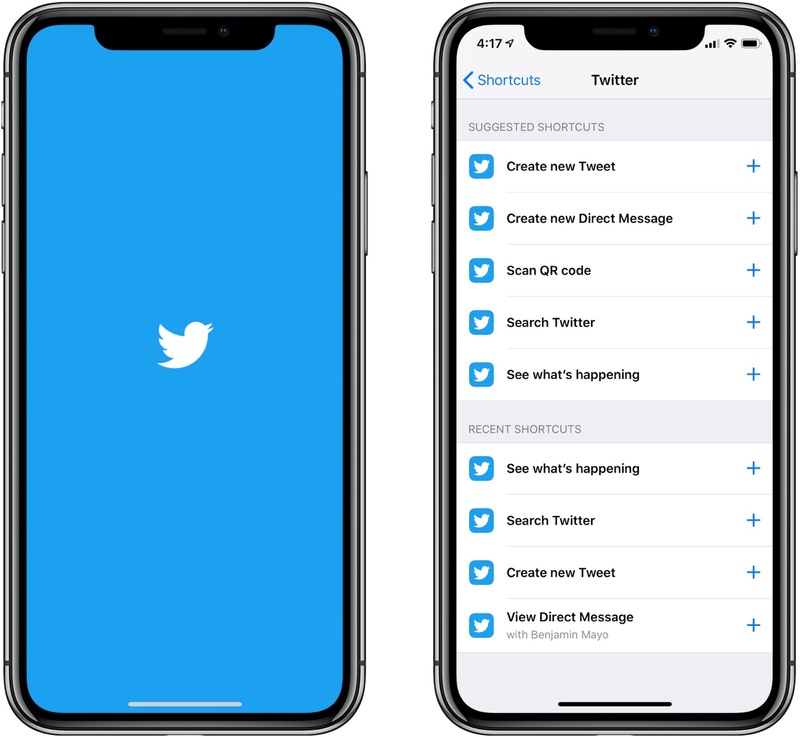 It may not have been on day one, but the day after iOS 12 launched, a Twitter update brought the power to create shortcuts for actions like creating a tweet or DM, scanning a QR code, searching Twitter, opening the search/explore tab in the app, and reopening a specific DM thread. Each of these is a standalone action that launches a specific function or area in the app, and none of them can be combined with input to pre-fill things like search boxes or DM fields. Despite that shortcoming, I can still see these shortcuts being useful timesavers, especially when run from places like the Shortcuts app's widget. Most of all, I'm just thankful to continue seeing Twitter care about adopting native iOS features in its app. Ryan: Evernote the company may be undergoing some challenging times, but those haven't stopped it from bringing immediate support for shortcuts on iOS, and in an impressive manner. While some writing apps have opted to provide only limited shortcut options, Evernote has done a good job letting users select for themselves from a wide array of possibilities. Some of the most commonly used Evernote shortcuts will likely be those that launch you into specific notes or notebooks, or enable creation of new camera and audio notes. However, the app also includes more niche shortcuts, like one that copies a specific note's link to the clipboard, another that prints your current note, and a shortcut for converting your current note to a PDF. Finally, one of my favorite shortcuts lets you save a previous search query; running the search shortcut has worked extremely quickly on my iPhone X, immediately loading the search results with no further taps or actions needed. If you have a Premium subscription, this search shortcut becomes even more powerful because it will include results from inside note attachments. With these shortcuts, Evernote also provides easy ways to create each of them, with options available throughout the app in various menus. While I'm still content with Apple Notes as my primary note-taking app, Evernote's extensive shortcut support out of the gate has me pleasantly surprised. 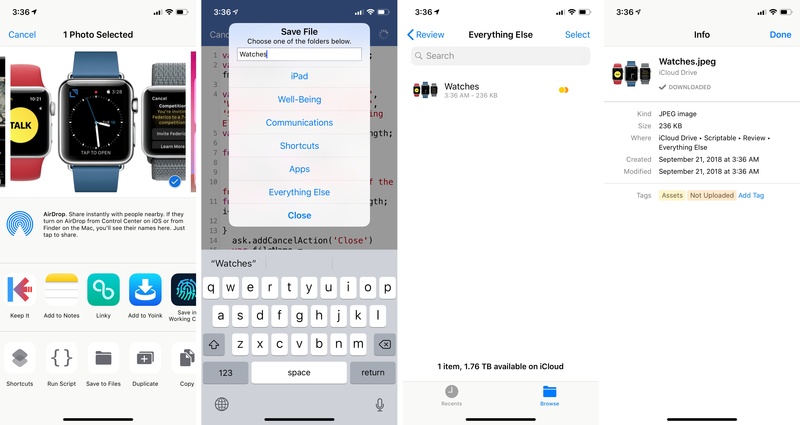 Ryan: I group these two together partly because they're both writing apps, but more because each app has a fairly limited set of supported shortcuts. Agenda offers a saved search feature in its app already, so the now-included shortcuts for those searches was a given. You can also setup shortcuts that open specific notes, projects, and overviews. Unfortunately I haven't discovered a way to create any shortcuts from inside the app itself, so Agenda users will need to check Settings.app for actions you've repeated multiple times so they'll appear as shortcut suggestions. Day One's shortcuts support is exclusive to new entry creation. For each journal you keep in Day One, you can set up shortcuts to create a new text, camera, or audio recording entry in the app.